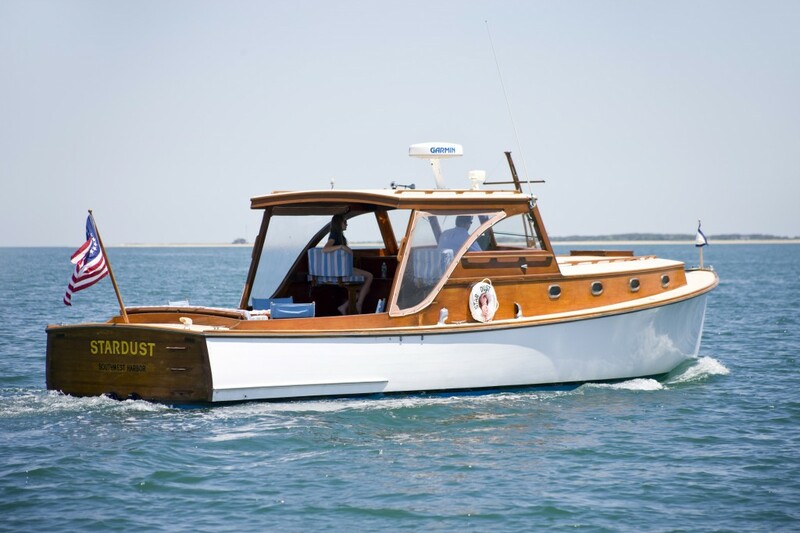 THE STORY: Fifty years later, Stardust, a 1966 twin-engine 39′ Bunker and Ellis, has arrived back at Ellis Boat Company – back to where she was built, 265 Seawall Road in Southwest Harbor. Don Ellis recalls the building of Stardust (as a teenager in 1966), with the famous builders Raymond Bunker and Ralph Ellis. In particular, he recalls the mahogany hull – only a few of the Bunker and Ellis hulls were built with mahogany. Bunker and Ellis built 58 custom boats from 1945 to 1978. At 39 feet with twin-engines, Stardust is extremely maneuverable and seaworthy. This was one of four 39′ yachts that Raymond Bunker and Ralph Ellis built together. A FEW DETAILS: 1 1/4″ mahogany planking over 2 1/2″ x 1 5/8″ oak frames. Oak keel, stem, stern & deck framing, floor timbers, dead wood, sternpost, and guard rails. Bronze screw refastened 1995. Decks are 1-foot cedar painted buff. Cabin sides, pilot house, and coaming are varnished mahogany. Varnished mahogany toe and guard rails covered with SS half oval. Cockpit size is 9′ x 8’9″. Twin 350 HP 2007 Volvo marine engines. She sleeps a total of 5 below in 2 staterooms. If you are interested in becoming the lucky new owner of this amazing vessel with its incredible place in the history, call Shane Ellis at 207-244-9221 (x6) or 207-266-7911. Or email shane@ellisboat.com.